Work-related injuries and accidents cost U.S. companies more than $62 billion dollars each year (Bureau of Labor Statistics). Musculoskeletal disorders make up more than one-third of those and are completely preventable. Imagine improving employee health, increasing productivity, and decreasing workers’ compensation costs. 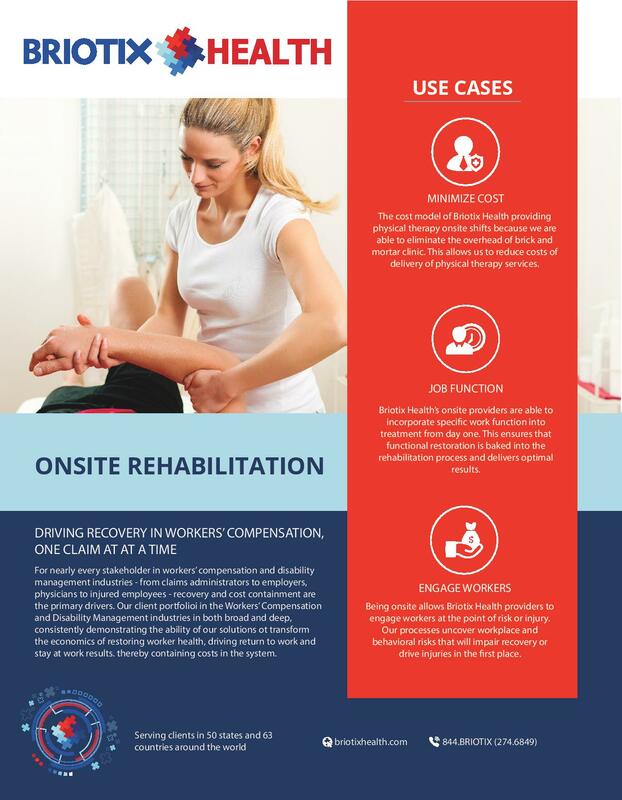 Many companies are able to do just that with a comprehensive injury prevention and rehabilitation program that includes onsite physical therapists in the workplace. Briotix Health physical therapists understand the science of ergonomics and identify risks onsite. Then, we put a plan in place to address those risks to reduce injuries, OSHA recordables, and workers’ comp claims. In the event an injury does occur, Briotix Health ergo physical therapists provide job function solutions. This helps employees return to work sooner and reduce the risk of repeat injuries. 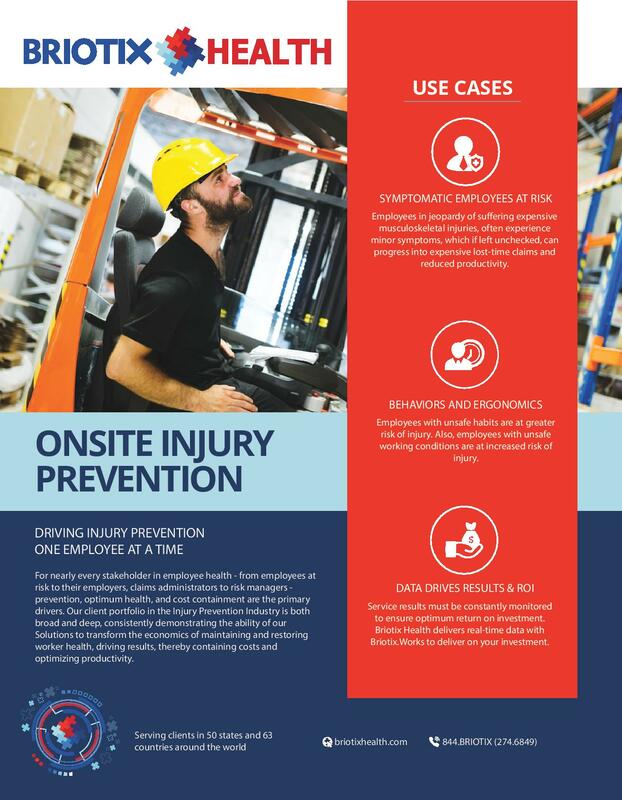 Injury prevention impacts not only employee health but also your bottom line. An effective injury prevention and wellness program improves productivity and decreases workers’ compensation costs. Briotix Health visits with employees, offers training, and helps identify targeted solution. This builds trust, enabling employees to be more open about injuries. In turn, that causes them to be more likely to put our suggested solutions in place and decrease risk of injury. 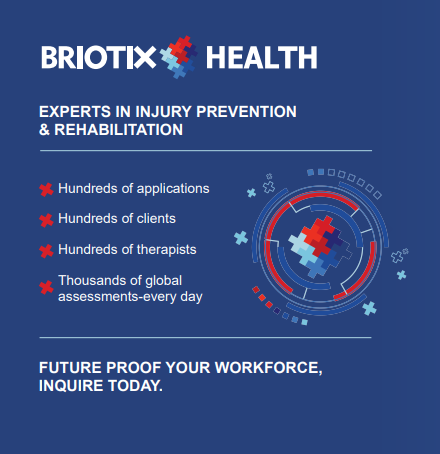 Briotix Health identifies workplace and behavioral risks that lead to injury and compensation claims. This allows us to provide solutions to prevent injuries from occurring in the workplace. With Briotix Health onsite early discomfort management, more than 94% of symptoms do not escalate to a claim. Briotix Health onsite physical therapists learn on the job. By knowing what’s required of your employees, we can create customized solutions to improve employee health and wellness. Onsite physical therapy is not only a perk for employees. It’s also more effective and efficient for employers. 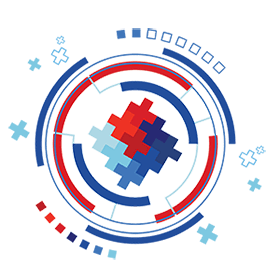 Briotix Health onsite therapy solutions encompass plans specific to the injury and the situation. We’re able to incorporate work functions into treatment from day one. This means that improved functionality is a priority for the rehabilitation process. It also means optimal results. 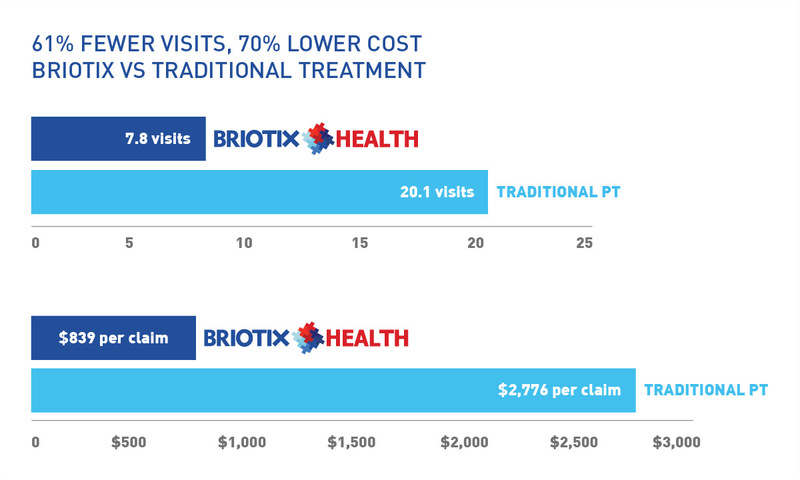 Employees who use Briotix Health onsite physical therapy have 61% fever visits and 70% lower costs when compared to traditional physical therapy. This is because our Industrial Sports Medicine Professionals create personalized plans that extend outside of sessions and reduce workers personal risk factors. The injured employee and Briotix Health provider communicate as a team for an efficient recovery. The Briotix Health provider delivers frequent updates to you about the process and necessary job modifications. Being onsite allows Briotix Health providers to engage workers at the point of risk or injury. Our processes uncover workplace and behavioral risks that will impair recovery or drive injuries in the first place. Once we learn of these risks, we create targeted solutions to reduce the likelihood of injury. One of the biggest fears upon a worker’s return to work is the increased risk for repeat injuries. Our Industrial Sports Medicine Professionals customize the therapy to teach individuals how to complete their tasks in a safer manner. Our Onsite Industrial Sports Medicine Professionals are the experts you need to stop injury progression in its tracks. Including Early Discomfort Management, a service emphasizing early detection of discomfort and physical strain. Tactics are personalized to each employee and focus on job coaching. We also offer Industrial Athlete Coaching, a service designed to prevent the progression of physical issues and erosion in productivity via group bio-mechanical intervention, support with physical conditioning and manual material handling best practice coaching. Additional services include: Job Analysis (JA), Job Hazard Analysis, Team Training, Post-Offer Testing, Return to Work Job Coaching and Wellness Programming. Briotix Health offers a variety of ergonomic assessments to fit your employee needs. Ranging from ADA to standard discomfort support to wellness-based assessment services. Lunch-and-Learn and topical trainings on movement back health, stretching for work, ergo 101, ergonomics for managers, and more are available from our health and safety consultants, certified ergonomists, physical therapists and occupational therapists worldwide. 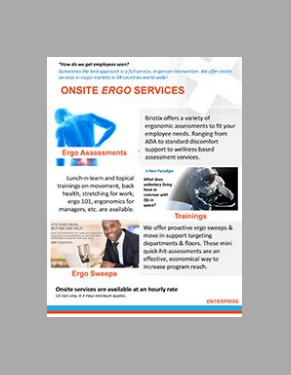 We offer proactive ergo sweeps & move in support targeting departments & floors. These mini quick assessments are an effective, economical way to increase program reach. We are leading providers of onsite occupational therapy and rehabilitation services including onsite treatment, return-to-work support, and stay-at-work job coaching. These services are provided onsite at your facility in a designated location, significantly reducing time off the clock and improve participation.